With cybercrime on the rise, it’s more important than ever to have the right email security. From your inbox to your employees, you need to know that every avenue a hacker could take is blocked. Read the below assets to make sure you stay informed—and stay safe. Being trustworthy could be your downfall when it comes to new spam methods. See how Predictive Sender Profiling can help secure your emails. Take control over the growing number of spam and virus attacks. Discover how to secure your email gateway and prevent malware entering your system. What attacks is your business likely to face? What’s the current state of the cyber-crime arena? How can you guarantee total security? Find out in infographic. Read our advanced threat protection (ATP) white paper to ensure you’re protected on every level—from spear phishing to social engineering. Explore a security strategy that remains effective over time, is agile, and able to detect rapidly changing dangers. 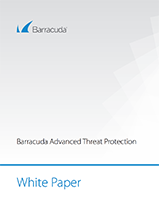 With Barracuda Email Security Gateway, you get comprehensive, long-term email threat protection, wrapped up in an affordable, easy-to-use package. Traditionally, using email encryption has been complex. But it’s vital to protect your business. See how we make it simple in this white paper. To encrypt and store email messages and attachments, you can integrate Barracuda Email Security Gateway and Barracuda Message Archiver to capture all inbound and outbound messages. 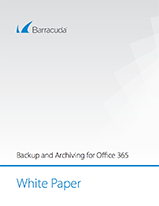 In this white paper, you can see the specific needs backup and archiving address; why you need them for Office 365; and why you shouldn’t use a single solution to encompass both. Our Message Archiver and Cloud Archiving Service enhance Office 365. Read the solution brief to see exactly how we improve it. See how Barracuda Cloud Archiving Service helps you demonstrate compliance, support audits, and access all messages. Migrating to Office 365 represents a significant step for any organisation. Read this research report to see what you should and shouldn’t do during the process. Good e-discovery practices and the technologies that support them are essential for any organisation. Read this research report to see best practice. 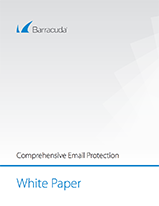 Read our white paper to see how you can secure your entire email infrastructure against advanced email threats like spear phishing attacks, account takeover, business fraud and data loss. 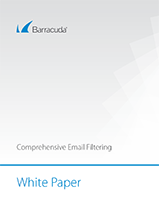 Discover how Barracuda Essentials for Email Security ensures email security, compliance and continuity, in an affordable package. See how our cost-effective Essentials for Office 365 defends you against all email-based threats—from DoS attacks to phishing. Why is phishing spelt with a ph? What makes spear phishing different? Who’s a potential target? Learn all about spear phishing, and most critically, how to stay safe, in our white paper. See how Barracuda Sentinel guards your business against spear phishing, impersonation, cyber fraud and compromised emails. Read this research report for an understanding of the current cybersecurity space, and what best practice you should be following. Impersonations are increasingly more common, sophisticated and targeted. Read about the most common impersonation attempts you should watch out for. From ransomware and trojans to phishing and social engineering, the list of email-borne threats gets longer by the day. Discover more about the reality of email security, and why training could be your best protection. There are thousands of threats that easily bypass standard email filters. We can help you find them. Our email threat scanner identifies the security and compliance threats that are currently in your account. © Barracuda 2018. All rights reserved.